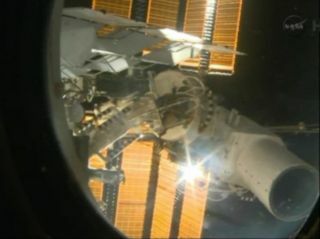 The Canadian company UrtheCast and its Russian partners are investigating what went wrong when its new Earth-watching cameras suffered a glitch shortly after being installed outside the International Space Station last week. In an eight-hour spacewalk on Friday (Dec. 27), Russian cosmonauts Oleg Kotov and Sergey Ryazanskiy installed UrtheCast's two powerful cameras on the orbiting outpost only to have to remove and return the devices to storage after an unspecified data connection problem. UrtheCast officials announced Monday (Dec. 30) that the Earth-watching cameras were installed properly, but mission controllers were unable to confirm the cameras were receiving power from the space station, so the devices were removed as a safety precaution. George Tyc, UrtheCast's Chief Technology Officer, said the fact that neither camera could communicate with Russia's Mission Control Center just outside of Moscow suggests the root of the problem is inside the space station. "This kind of issue has been encountered before on the ISS and can be fixed in the near-term," Tyc said in a statement. "Bringing the cameras back inside to be installed another day was simply the right engineering decision." The cameras launched to the space station in late November as part of the Russian Progress 53 cargo delivery. Once installed and properly running, the cameras are supposed to beam detailed views of Earth from space in near real-time to UrtheCast customers online. RSC Energia, Russia's main space contractor, has formed a commission to work out the problem with UrtheCast's engineering team, according to the Canadian company. UrtheCast officials say they expect to announce by mid-January the date of a rescheduled spacewalk to install the cameras. "Delays like this happen in space. That's the nature of the business," said UrtheCast CEO Scott Larson. "The critical thing is to proceed carefully and deliberately, without taking undue risk. Fortunately, our project is on a manned platform, which gives us the ability to respond to incidents of this kind as they arise."